Dmitri Shostakovich was the Soviet Union’s greatest composer and a prime example of the artist under a totalitarian system. 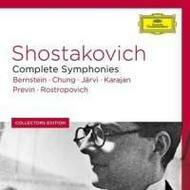 His works – including the 15 symphonies in this collection – unite powerful emotional expression with formal mastery. These acclaimed recordings are conducted by some of his finest interpreters.